A breech-loading weapon is a firearm in which the cartridge or shell is inserted or loaded into a chamber integral to the rear portion of a barrel. Modern mass production firearms are breech-loading (though mortars are generally muzzle-loaded). Early firearms were almost entirely muzzle-loading. The main advantage of breech-loading is a reduction in reloading time—it is much quicker to load the projectile and charge into the breech than to force them down a long tube, especially when the tube has spiral ridges from rifling. In field artillery, breech loading allows the crew to reload the weapon without exposing themselves to enemy fire or repositioning the piece (as was required for muzzle-loaded weapons) and allows turrets and emplacements to be smaller (since breech loaded weapons do not need to be retracted for loading). Early types of breech loaders from the 15th and 16th century on display at the Army Museum in Stockholm. Although breech-loading weapons were developed as far back as the late 14th century in Burgundy, breech-loading became more successful with improvements in precision engineering and machining in the 19th century (see Dreyse needle gun). The main challenge for developers of breech-loading weapons was sealing the breech. This was eventually solved for smaller weapons by the development of the self-contained metallic cartridge. For weapons too large to use cartridges, the problem was solved by the development of the interrupted screw. Breech-loading swivel guns were invented in the 14th century. They were a particular type of swivel gun, and consisted in a small breech-loading cannon equipped with a swivel for easy rotation, and which could be loaded by inserting a mug-shaped chamber already filled with powder and projectiles. The breech-loading swivel gun had a high rate of fire, and was especially effective in anti-personnel roles. Henry VIII breech loading hunting gun, 16th century. The breech block rotate on the left on hinges, and is loaded with a reloadable iron cartridge. Thought to have been used as a hunting gun to shoot birds. The original wheellock mechanism is missing. Breech-loading firearm that belonged to Philip V of Spain, made by A. Tienza, Madrid circa 1715. It came with a ready-to-load reusable cartridge. This is a miquelet system. Mechanism of Philip V's breech-loading firearm (detail). 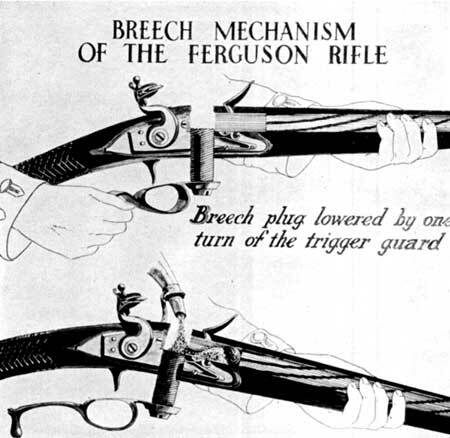 The breech mechanism of the Ferguson Rifle. Breech-loading firearms are known from the 16th century. Henry VIII possessed one, which he apparently used as a hunting gun to shoot birds. More breech-loading firearms were made in the early 18th century. One such weapon is known to have belonged to Philip V of Spain, and was manufactured circa 1715, probably in Madrid. It came with a ready-to load reusable cartridge. Patrick Ferguson, a British Army officer, developed in 1772 the Ferguson rifle, a breech-loading flintlock weapon. Roughly two hundred of the rifles were manufactured and used in the Battle of Brandywine, during the American Revolutionary War, but shortly after they were retired and replaced with the standard Brown Bess musket. Later on into the mid-19th century there were attempts in Europe at an effective breech-loader. There were concentrated attempts at improved cartridges and methods of ignition. In Paris in 1808, in association with French gunsmith François Prélat, Jean Samuel Pauly created the first fully self-contained cartridges: the cartridges incorporated a copper base with integrated mercury fulminate primer powder (the major innovation of Pauly), a paper casing and a round bullet The cartridge was loaded through the breech and fired with a needle. The needle-activated central-fire breech-loading gun would become a major feature of firearms thereafter. The corresponding firearm was also developed by Pauly. Pauly made an improved version, which was protected by a patent on 29 September 1812. The Pauly cartridge was further improved by the French gunsmith Casimir Lefaucheux in 1828, by adding a pinfire primer, but Lefaucheux didn't register his patent until 1835: a pinfire cartridge containing powder in a card-board shell. In 1846 another Paris Frenchman, Benjamin Houllier, patented the first fully metallic cartridge containing powder in a metallic shell. Houllier commercialised his weapons in association with the gunsmiths Blanchard or Charles Robert. But the subsequent Houllier and Lefaucheux cartridges, even if they were the first full-metal shells, were still pinfire cartridges, like those used in the LeMat (1856) and Lefaucheux (1858) revolvers, although the LeMat also evolved in a revolver using rimfire cartridges. A year before Houllier's invention, in 1845, the Frenchman Louis-Nicolas Flobert invented, for indoor shooting security, the first rimfire metallic cartridge, constituted by a bullet fit in a percussion cap. Usually derived in the 6 mm and 9 mm calibres, it is since then called the Flobert cartridge or the Bosquette cartridge but it doesn't contain any powder, the only propellant substance contained in the cartridge is the percussion cap itself. In English-speaking countries the Flobert cartridge corresponds to the .22 BB and .22 CB ammunitions. The first centrefire cartridge was introduced in 1857 by Pottet, with both Berdan and Boxer priming. In 1842, the Norwegian Armed Forces adopted the breechloading caplock, the Kammerlader, one of the first instances in which a modern army widely adopted a breechloading rifle as its main infantry firearm. The Dreyse Zündnadelgewehr or Dreyse needle gun, was a single-shot breech-loading rifle using a rotating bolt to seal the breech. It was so called because of its .5-inch needle-like firing pin, which passed through a paper cartridge case to impact a percussion cap at the bullet base. It began development in the 1830s under von Dreyse and eventually an improved version of it was adopted by Prussia in the late 1840s. The paper cartridge and the gun had numerous deficiencies; specifically, serious problems with gas leaking. However, the rifle was used to great success in the Prussian army in the Austro-Prussian war of 1866. This, and the Franco-Prussian war of 1870–71, eventually caused much interest in Europe for breech loaders and the Prussian military system in general. In 1860, the New Zealand government petitioned the Colonial Office for more soldiers to defend Auckland. The bid was unsuccessful and the government began instead making inquiries to Britain to obtain modern weapons. In 1861 they placed orders for the Calisher and Terry Carbine, which used a breech loading system using a bullet consisting of a standard Minie lead bullet in .54 calibre backed by a charge and tallowed wad, wrapped in nitrated paper to keep it waterproof. The carbine had been issued in small numbers to English cavalry (Hussars) from 1857. About 3–4,000 carbines were brought into New Zealand a few years later. The carbine was used extensively by the Forest Rangers, an irregular force led by Gustavus von Tempsky that specialized in bush warfare and reconnaissance. Von Tempsky liked the short carbine, which could be loaded while lying down. The waterproofed cartridge was easier to keep dry in the New Zealand bush. Late in the 1860s the New Zealand Government had about 1800 carbines issued or in storage. It is believed by researchers that the balance was sold to private citizens and militia during the Waikato War. Museums in New Zealand hold a small number of these carbines in good condition. At least one New Zealand example, fully carved in traditional Māori style, was sold in recent times in the UK. It is not known if this weapon was used by Māori fighting for von Tempsky or if it was a captured weapon or one of the carbines sold to private citizens. During the American Civil War, many breechloaders would be fielded. The Sharps used a successful dropping block design. The Greene used rotating bolt-action, and was fed from the breech. The Spencer, which used lever-actuated bolt-action, was fed from a seven-round detachable tube magazine. The Henry and Volcanic used rimfire metallic cartridges fed from a tube magazine under the barrel. These held a significant advantage over muzzle-loaders. The improvements in breech-loaders had spelled the end of muzzle-loaders. To make use of the enormous number of war surplus muzzle-loaders, the Allin conversion Springfield was adopted in 1866. General Burnside invented a breech-loading rifle before the war. The French adopted the new Chassepot rifle in 1866, which was much improved over the needle gun as it had dramatically fewer gas leaks due to its de Bange sealing system. The British initially took the existing Enfield and fitted it with a Snider breech action (solid block, hinged parallel to the barrel) firing the Boxer cartridge. Following a competitive examination of 104 guns in 1866, the British decided to adopt the Peabody-derived Martini-Henry with trap-door loading in 1871. Single-shot breech-loaders would be used throughout the latter half of 19th century, but were slowly replaced by various designs for repeating rifles, first used in the American Civil War. Manual breech-loaders gave way to manual magazine feed and then to self-loading rifles. Three-shot experimental breech-loading cannon (burst) of Henry VIII, 1540 1543. An animation showing the loading cycle for a large naval breech-loader. Notice that there is a series of interlocking doors that never permit an open path from the gunhouse, down which a flash might travel, to the magazine. 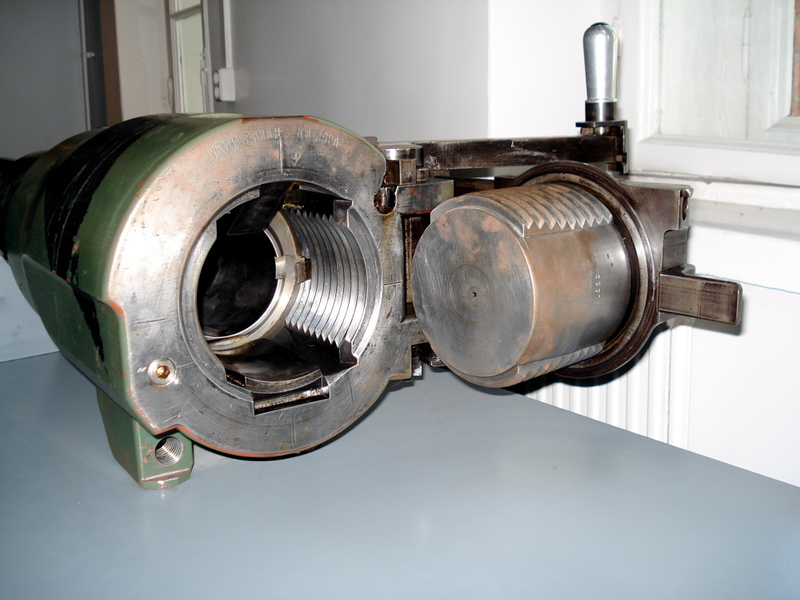 The first modern breech-loading rifled gun is a breech-loader invented by Martin von Wahrendorff with a cylindrical breech plug secured by a horizontal wedge in 1837. In the 1850s and 1860s, Whitworth and Armstrong invented improved breech loading artillery. The M1867 naval guns produced in Imperial Russia at the Obukhov State Plant used Krupp technology. ↑ Tower of London exhibit. ↑ Musée de l'Armée exhibit, Paris. ↑ Shooting section (la section de tir) of the official website (in French) of a modern indoor shooting association in Belgium, Les Arquebusier de Visé. ↑ Belich, James (1986). The New Zealand Wars. Auckland: Penguin. pp. 119–125. ISBN 0-14-027504-5. "Breech Loading Rifled Artillery". Global Security. http://www.globalsecurity.org/military/systems/ship/new-navy2.htm. Retrieved 2009-02-25. "History of the Rifled Cannon: Discovery of the Breech-Loading Gun and Conical Projectiles". July 12, 1861. http://query.nytimes.com/gst/abstract.html?res=9F0CE6DA1F38E333A25751C1A9619C946091D7CF. Retrieved 2009-02-25. "An Illustrated History of Breech-Loading Guns". Scientific American past. 6/2/1894. http://www.scientificamericanpast.com/Scientific%20American%201890%20to%201899/5/lg/sci621894.htm .